This drink is another creation of tiki progenitor Don the Beachcomber. Created around 1941, it spawned numerous copycats, including the admittedly superior Jet Pilot from the Luau in Beverly Hills. As has been noted by Paul Clarke, this drink contains all of the elements of a Donn Beach tiki drink, from the multiple rums, exotic syrups and the quintessential Angostura bitters and Pernod combo. Combine all ingredients, add a handful of cracked ice, blend for 5 seconds and pour unstrained into a chilled glass with more ice. The drink leads off with spice notes from the falernum and bitters, segues to the rich rum flavors and dunder funk from the Jamaican rum specifically, and ends with the fruity orange liqueur and spicy anise sweetness of the pastis. Overall it gives a wonderful progression of flavors, without any one element dominating the drink. I find that getting the balance right on this cocktail can be a little bit tricky. The drink can tip either towards the sweet end, especially if you use something like Fee's falernum, or really get in your face if you use some more robust Jamaican rums like Smith & Cross or Coruba along with Blair Reynold's Dark Falernum. Though at first glance it looks like there's not enough lime juice to balance out the sweet ingredients in this drink to properly, you have to take into account the fact that this is a blender drink and those need a bit more sugar. I also tend to prefer using aged Puerto Rican rums rather than light ones in applications like this as it lends a bit more richness and backbone to the drink. But no matter how you make it, this is going to be one tasty cocktail. This is a nice little brandy based tiki drink that was modeled on the Sunakora from Beachbum Berry's Sippin' Safari. The Sunakora was named after Don the Beachcomber's ex-wife, Sunny Sund, who was nicknamed "Sunakora, Queen of the Beachcombers". So in a twist, I named this drink after a woman who bucked her Puritan tutors to become one of the most powerful and long-ruling queens of Tahiti in the 19th century. The falernum is the first thing you taste in this drink, followed swiftly by the oak-tempered flavors of applejack and cognac and the panoply of fruits. The Angostura bitters play their part throughout, reinforcing the falernum and spirits and keeping the honey in check, leading to a finish strikingly reminiscent of Coca Cola. If you like your drinks a bit more sour, you can back off on the honey syrup a bit without radically disturbing the balance of the drink. Over the holidays I returned home to Seattle to visit my parents. During those weekends I've found myself with some time in the evenings and decided to find a good place to get some scotch. As luck would have it, St. Andrews Bar and Grill is within walking distance of home and has one of the widest selections of scotch whisky I've ever seen. To top off how great this place is for trying scotch, the pours are astoundingly healthy, probably as much as 2.5 oz, and priced the same as you would pay to get a standard 1.5 oz pour anywhere else. So you'll get more than enough to savor and discover the flavors and smells within each dram without it costing an arm and a leg. The staff were knowledgable and gave me good recommendations for what to try within a given style. The ambiance is that of a fairly standard sports bar or local pub. There are numerous TV screens showing a variety of different games at any given time, but thankfully the volume wasn't too loud so it's reasonably easy to tune them out. Even on a Friday or Saturday evening, it wasn't too crowded and I never had trouble getting service. They have a decent selection of good beer, though their cocktails looked to be pretty standard fare (I don't trust anything with neon sour mix). Overall, I'd say that it's a great resource for anyone interested in scotch. The selection is vast, the pours are generous and the prices are quite reasonable. This is a continuation in my series reviewing the Rhum J.M. line of rhum agricole. The VSOP expression has been aged for a minimum of four years in American oak and French Limousin oak casks. This makes is several times older than the élevé sous bois expression and about half as old as the 1997 Vintage above it. This rhum is definitely a step up from the élevé sous bois bottling in terms of refinement and the nuance of the flavors. Age has made it a bit drier and more of the spice characteristics have emerged. Nutmeg seems to be a particularly strong element in the aged J.M. rhums, along with the usual grassy brandy flavors. It's set up well for sipping neat, both because of the extra time in the barrel and because its at a slightly more gentle 90-proof. I got incredibly lucky and was able to find this rhum for ~$35. It usually goes for $55-60, so that was quite a deal. Obviously I stocked up and hopefully I should have enough to last years if not decades. At the regular price it's a little bit hard to justify over either Rhum J.M. Gold, which has a much smaller unit price, or Clément VSOP, which is at least as good and a bit cheaper. And while Rhum J.M. VSOP is an incredibly good sipper, it also makes some rather solid cocktails. Much like the Clément VSOP, it's a shoe-in for a Donga Punch. The balance with Rhum J.M. VSOP is absolutely fantastic, with the rhum, grapefruit, lime and cinnamon syrup in perfect tension, making it hard not to drink it all down in one go. As a side note, white grapefruit, which also gets sold as 'Cocktail Citrus', is in stores right now and makes much better drinks than its pink cousin. There's something almost spicy about white grapefruit juice and it adds quite a bit of vibrancy to tiki drinks. This is a slight tweak on the Don's Beach Planter from Jeff Berry's Sippin' Safari, by replacing the pineapple juice with grapefruit and bumping up the r(h)ums by 50% to keep them from disappearing among the strong fruit flavors. The balance ends up being pretty good. The grapefruit and passionfruit synergize nicely, actually producing a flavor not too far off from pineapple, which confused me a bit when I took the first sip. The r(h)ums are right behind, with the funky notes hooking up with the Angostura bitters and Herbsaint. Overall this is another potent tiki drink that sneaks up on you, but provides a very satisfying experience. Over the course of the last couple of evenings, I've tried three different sherried cask strength single malts from Aberlour, Glenfarclas and Macallan. There were a fair number of similarities between each scotch, especially in terms of the method of aging, their lack of age statements, their bottling proofs, and the fact that each is a big step up from their 12-Year old, lower-proof siblings. At the same time, the fairly wide range of prices means that some seem more worthwhile than others. These reviews are slightly provisional as I tried all three at a bar and thus haven't taken my normal route of tasting a spirit several times on different days. However, they were all fairly healthy pours, so I did get to spend a fair bit of time nosing and tasting each whisky. This is a non-chill filtered, cask strength Speyside single malt from Aberlour. Bottled right around 120 proof (there are small variations from batch to batch), it comes with no age statement, but is likely a blend of malts aged from 10-15 years exclusively in ex-Oloroso sherry barrels (I've also had the 12 year and don't detect significantly more barrel influence in the A'Bunadh). My succinct description of this whisky is that it's breakfast in a glass. The intense maple syrup and oatmeal flavors, especially on the nose, make that an inescapable association. Though it commands a fairly significant premium over the aforementioned 12 Year expression, it's also a huge step up in terms of the intensity and variety of flavors. It's a little bit difficult to find info on the exact details of how this whisky is produced. Glenfarclas is also located in Speyside and this whisky is clearly aged in ex-sherry barrels, but I haven't been able to figure out what type of sherry used to reside in the barrels. It is bottled at 105 British proof, which is the same as 120-proof or 60% ABV in the usual sense. As with all of these whiskies, there is no age statement, but what I've read suggests that all of the barrels that are blended to make the final spirit are at least 10 years old and I would say that it seems to be as mature as the A'Bunadh. The hefty dose of bittersweet chocolate found throughout the experience of consuming this whisky ticks it a few marks above the others, but it's hampered by costing at least $20 more than the next most expensive. 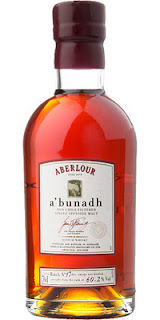 As with the Aberlour, also I find this to be a significant step up from the lower-proof 12 Year bottling from Glenfarclas, both in terms of the range of flavors and their depth. Whether it's worth the extra coin is up to you. In a slight divergence from the other two cask strength whiskies I tried, Macallan is part of the broader Highlands region rather than the Speyside sub-region. However, they claim that Speyside is their 'spiritual home' and its style is very similar to other Speysiders. Macallan has a tradition of aging all of their whiskies in ex-sherry casks. The Cask Strength expression is part of their Sherry oak line, which are all matured in casks made from Spanish oak. There is no age statement on this scotch (though it is now giving way to a 10-Year Cask Strength expression), but it seems as mature as the 12-Year, so my guess is that the average age of the whiskies blended to make this spirit is right around there. This was the simplest cask strength scotch I tried, being a fairly clear evolution from the basic Mac 12-Year, with the PX sherry-heavy nose. However, the smells and flavors are much richer and there is a certain appeal to the heavy dose of pepper that emerges mid-palate, helping to keep it from becoming insipidly sweet and unidimensional. Additionally, it can occasionally be found for as little as $55, which makes it no more expensive than the Mac 12 and an obvious choice over that expression. Up at $65+, I would say that the Aberlour edges it out, though the A'Bunadh is a little bit sweeter. To line these three whiskies up, I liked the Glenfarclas a bit more than the Aberlour, which was an improvement over the Macallan. Additionally, the Aberlour is probably the best value out of the three, unless you can find the 'Farclas or Macallan on sale. However, if you're looking for a sherry bomb, it's hard to go too far wrong with any one of the three. You'll just have to try them and see which tickles your fancy. Last week I reviewed the youngest member of the Rhum J.M. line. Next up is their Gold or Élevé Sous Bois (rough trans. "raised under wood") expression. This is a lightly aged rhum agricole that spent 12 months in small, new oak barrels before being bottled. That added a golden hue to the rhum and also quite a bit of complexity. For having spent only a year in the barrel, this spirit has gained a lot of flavors that aren't found its younger sibling. While primarily designed for use in cocktails, I'm actually quite happy sipping this rhum, especially after bringing down the strength just a bit. I find it quite interesting how water brings out more traditional molasses-based rum flavors in the nose, while retaining rhum agricole flavors on the palate. While this rhum can be a little bit on the pricy side, the fact that it usually comes in 1 L rather than 750 mL bottles here in the states helps to keep the unit cost a little bit more manageable level. However you happen to enjoy it, this is an excellent spirit to add to your stash. Especially if you want a single rhum agricole to do double duty as both a sipper and for cocktails, this would be high on my list of recommendations. 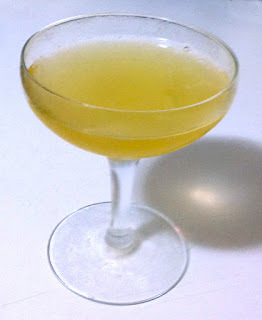 This drink is based on the Honeymoon Cocktail, which is itself a subtle tweak of the standard Sidecar. 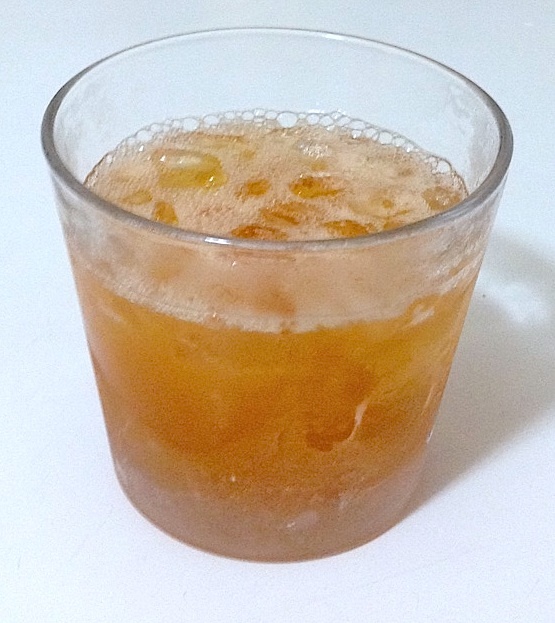 On the nose, the drink presents you with subdued herbal grassiness from the rhum and Bénédictine, with a nice dose of orange thrown in from the liqueur. 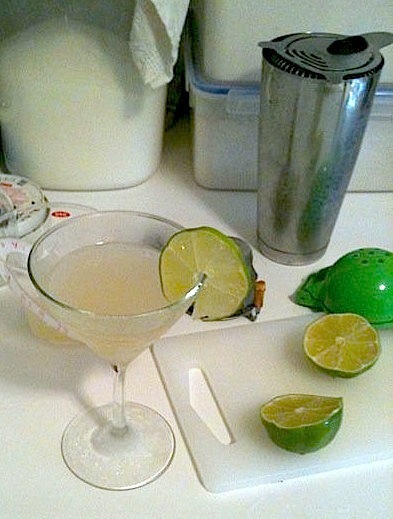 The orange liqueur as leads the charge on the sip, which transitions into somewhat sharper and slightly bitter flavors from the Bénédictine and rhum, while the lime juice can be detected throughout, giving it a bit of snap. Put another way, it begins with a more tropical feel and then switches to something more like a classic cocktail. The high proof of the rhum agricole helps to keep up the backbone of the drink without becoming dominant. Overall I really like this cocktail because of the range of flavors that emerge as the drink crosses your palate and the drier finish that makes it decidedly more-ish. Single barrel bourbons form another element of the bourbon spectrum, along with small batch and regular large batch bourbons. The idea is that consumers can experience the barrel to barrel variation that gets washed out in large batch and small batch bourbons. This makes a virtue out of what would otherwise be a flaw to consumers who expect to get exactly the same product every time they pick up a bottle of spirits. That consistent flavor profiles can be maintained despite the vagaries of fermentation, distillation and aging speaks volumes about the skill possessed by master blenders. But to get back to the single barrel bourbons, there is a lot to be said for these whiskies, both in terms of the variety of experiences that can be had from them and the excellent values they can sometimes represent. This is, in my opinion, one of the best values in bourbons out there. Less sweet than much of its competition, the focus is on the flavors provided by the rye and oak. Ezra B is produced by the Heaven Hill distillery for Luxco with the standard HH mash bill of 75% corn, 13% rye and 12% malted barley. This bourbon has spent a very solid 12 years in the barrel and my particular bottle was bottled in October 2010 at an extremely respectable 99 proof. I really like how this whiskey shows to very distinct faces depending on whether or not you add any water to it. At full strength, it's very dry and herbal. With a little water, a more classic bourbon character emerges. Additionally, I get out something different almost every time I sit down to drink it, which provides a nicely varied experience. The dry herbal and chocolate flavors are probably my favorite that I've found in this bourbon. Best of all, Ezra B SB usually retails in the mid-20s, which is only a few bucks more than a lot of standard bourbons. Highly recommended. Given that Evan Williams is also produced by Heaven Hill and has the same mash bill as the Ezra B, the two are a very interesting contrast. The Evan Williams SB is aged for 11 years. My bottle was barreled on 9/13/01 and bottled on 4/20/11, at a fairly gentle 86.6 proof. In my opinion that last bit of data is the only major flaw in this otherwise pretty tasty bourbon. The entire point of single barrel bourbons is the unique experience one will get from them and it seems best to provide that experience at relatively full blast. While it's a very nice, albeit very sweet, whiskey, bottling at somewhere in the 95-105 proof range would probably kick it up several notches. With that said, if you want something that's going to be good straight out of the bottle and not be too hard on the pocketbook, you can't go far wrong with the Evan Williams SB. I'd pick the Ezra B first since they're both right around the same price, but your preferences may vary. 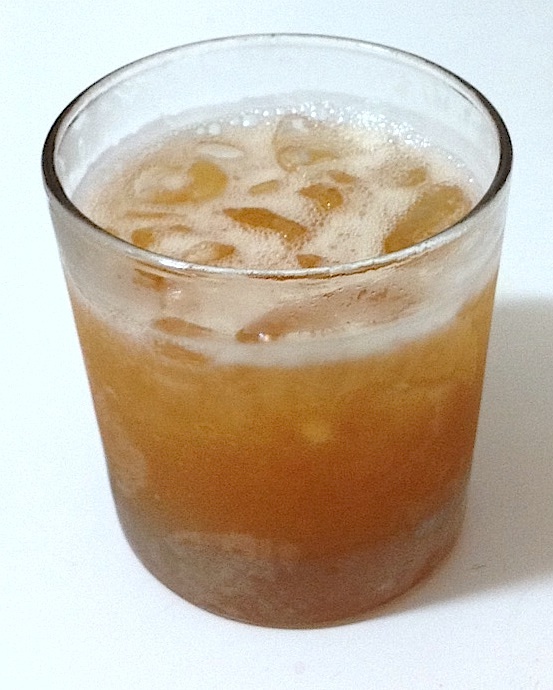 This scotch drink was inspired by the Polynesian Paralysis. 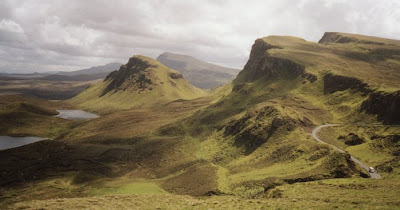 I recently purchased a bottle of Isle of Skye 8 Year blended scotch, which is largely made from a mix of smokey Talisker single malt, sweeter Speyside single malts and lengthened with grain whisky. Combine all ingredients, add a handful of cracked ice, blend for five seconds, then pour unstrained into a chilled rocks glass full of ice. The taste begins off with the malt whisky base and Angostura bitters, followed by the almond and cherry flavors of the orgeat combined with the fruit flavors. The smokey barbecue notes from the scotch and the sharp anise of the Herbsaint show up in the finish, making it just a little bit dry and clearing the palette for another sip. This is the first in a series of reviews about the Rhum J.M. line of rhum agricole. The Rhum J.M. distillery is located, as with all A.O.C. marque rhum agricoles, on the French Caribbean island of Martinique. It dates back to 1845, when Jean-Marie Martin, whose initials are still affixed to the distillery, bought the Fonds Préville sugar plantation. The distillery passed through a number of hands over the course of the 19th and early 20th centuries, finally being bought by Gustave Crassous de Médeuil in 1914. Since then it has stayed in the hands of his descendants and relatives. 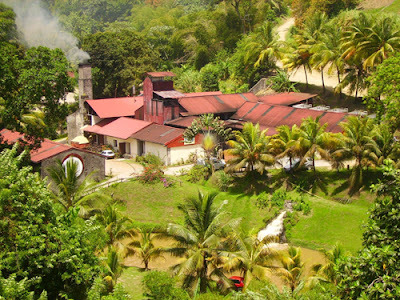 The distillery is situated on the northern end of the island in the shadow of Mt. Pelée. This is an active volcano, most notably wiping out the city of St. Pierre in 1902. While its position is risky, this location provides excellent volcanic soils for growing sugar cane as well as bananas and pineapples. All of the steps of rhum agricole production are carried out on the estate. Beginning with growing and harvesting the sugar cane, which is pressed within one hour after it is harvested to produce cane juice, which is then fermented, distilled and aged. Rhum J.M. Blanc is the youngest rhum agricole in their line. It is rested in stainless steel tanks for four months before being cut down to 100-proof and bottled. This makes for a very fresh rhum that is clearly an agricultural product. While some of its flavors can be a little off-putting for someone who is more used to smooth, mellow, vanilla-tinged white rums, rhum agricole blanc has its own charms. In some respects it is analogous to blanco tequila, which also tends to be be aggressively agricultural with a few rough edges that have not been smoothed by the brief rest before bottling. While this rhum is an interesting experience neat, its real purpose is in cocktails. The classic choice would be the Ti' Punch and, as I mentioned above, it subs in to recipes calling for blanco tequila, like a Margarita, quite nicely. 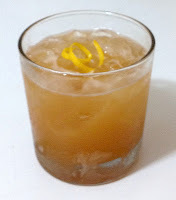 It also makes for an interesting twist on cocktails that call for white rum. Combine all ingredients, shake with ice and strain into a chilled cocktail glass that has been rinsed with Maraschino liqueur. This is hands down one of my favorite summertime drinks. The crispness of the rhum meshes with the bitter/spicy sweetness of the Maraschino perfectly while the sour lime and bitter grapefruit give it plenty of snap. For an extra-chilly drink, make it frappé style by blending the ingredients with a handful of crushed ice and pouring the liquid over a chilled glass full of crushed ice. It's like a Slurpy, but infinitely better. While the recipe originally called for white rum and I like it a lot with Flor de Caña Extra Dry, the rhum agricole blanc adds another dimension to the drink. The funkiness of the rhum syncs with the bitter cherry notes of the Maraschino and just rides over the fruit juices. Surprisingly, the Rhum J.M. doesn't overwhelm the drink even though it's 100-proof. Lastly, it's best to go a little easy on the sugar as the Maraschino rinse will add a bit of sweetness and the drink it meant to be snappy. Overall, I think Rhum J.M. Blanc is a great choice if you're looking for a blanc rhum agricole. The only downside is that it tends to be on the pricey side. Some of this is simply the fact that agricoles go for more than their molasses-based brethren, but J.M. Blanc is roughly the same price as Neisson and a bit more than La Favorite, the other two standard rhum agricole brands. However, if you happen to live in Washington, J.M. Blanc is currently discounted by ~$10 compared to the more standard price found down here in Oregon. I'd say that it's a good deal in the mid-30s, but a harder sell above $40/L. At that point there will probably only be a few dollars between the blanc and the slightly aged and significantly more complex J.M. Elévé Sous Bois, which will be reviewed in the next post of this series.